Departures: Arrival into Nairobi every day, minimum of two passengers required for Saturday & Sundays and four passengers for Monday to Friday, departures. Wing your way to Kenya’s premiere wildlife hot spots in the lap of luxury on our Kenya Flying Safari. A private SkySafari Grand Caravan has been custom outfitted to ensure your comfort and convenience. Combine this with incomparable game viewing opportunities, luxurious accommodations and intimate dining choices and the result is – without exception – the ultimate African experience. The carefully crafted itinerary of our Kenya Flying Safari visits some of the most iconic places and utilizes the services of some of the best qualified local guides throughout the journey. Your care and well-being are the primary concern of everyone you encounter on our Kenya Flying Safari, from the pilot and wildlife guides to the person who brings you your early morning coffee, thus allowing you to focus on the moment: whether that is the wondrous landscape, the remarkable wildlife or sipping a sundowner as the setting sun silhouettes the lone acacia tree on the horizon. An overnight flight takes you to Kenya, the birthplace of the safari. Welcome to Kenya! You are warmly welcomed on arrival at Jomo Kenyatta International Airport, met by your Great Safaris representative and chauffeured to your exclusive all-suite boutique hotel. Your 1 night stay at Hemingways Nairobi is on half board basis and drinks (excluding premium drinks). After breakfast, you will be transferred to Wilson Airport Nairobi – gateway to the flying safaris in Kenya – in time to board your private SkySafari executive class Cessna Grand Caravan and begin your Kenya Flying Safari! 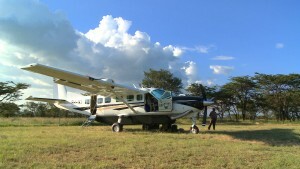 The flight to Amboseli National Park is a short 45 minutes. You will land in the middle of the park, where the Tortilis Camp team will be waiting to welcome you at the airstrip. You will board your safari vehicles to be transferred to your camp, with your first game drive en-route. After lunch, embark on an afternoon game drive. 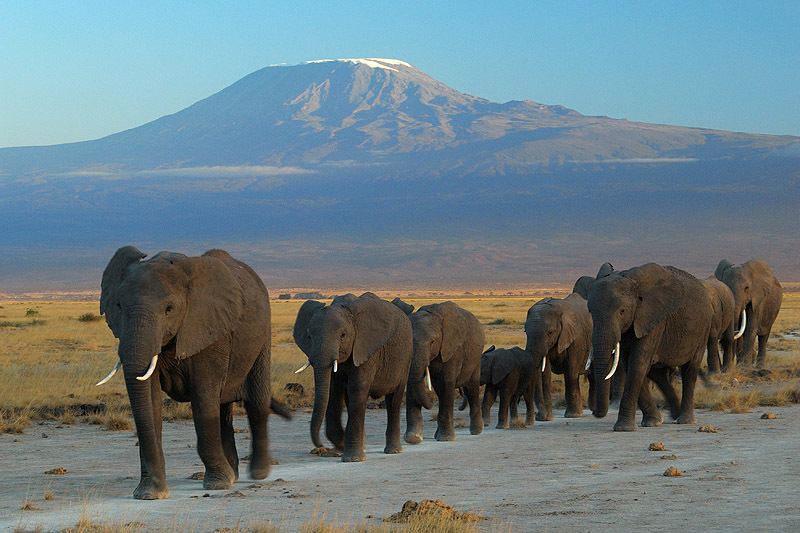 Amboseli is famous for being the best place in Africa to get close to free-ranging elephants, a population of over 1,500 elephants, among other wildlife species. Other attraction of the park includes opportunities to meet the Maasai people and also offers spectacular views of Mount Kilimanjaro, the highest free-standing mountain in the world. Enjoy your first sundowner, a daily staple of the safari experience, before driving back to the camp for dinner. Tortilis Camp serves a daily table d’hôte menu that can be tailored for preferences and special diets such as vegetarian, vegan, gluten-free, etc. Please ensure that you inform us in advance, so that the camp managers can prepare for your arrival. Your two night stay at Tortilis Camp, in an en-suite Safari Tent, is on all-inclusive basis (includes all meals, bush activities and drinks – excluding premium drinks). Today is a full day of activities in Amboseli National Park starting with an early morning walking safari. Take the time to leave the car behind and enjoy the small things – tracks, dung beetles, micro-ecosystems. Your Maasai guides are happy to share their knowledge of the terrain, traditional uses of wild herbs and barks, and the Maasai way of life. Enjoy a bush breakfast before returning to camp. The lush green wetlands in this otherwise dry area make Amboseli National Park one of the best wildlife-viewing areas on the planet, attracting over 600 species of birds including pelicans, kingfishers, crakes, hammerkops, 47 types of raptors. On your afternoon game drive, you are also likely to see cape buffalo, impala, hyena, giraffe, zebra, gazelle and wildebeest with lion and cheetah among the big cats that roam the area. Lion, cheetah, hyena and jackal hunt the prolific plains game. Rise early for a game drive and the last opportunity to capture that iconic photograph of Mount Kilimanjaro, and then back in time to the lodge for brunch. Transfer back to the Amboseli airstrip for your flight to Meru National Park located in the region just north of Mount Kenya and north of the equator. Landing at the Meru airstrip, the Elsa’s Kopje team will welcome you and you will be transferred to the Lodge, arriving in time for lunch. After lunch, guest’s will be offered a massage for pure relaxation, or alternatively, you will go on a game drive. Your stay at Elsa’s Kopje is for 2 nights in a Cottage Suite, and is on all-inclusive basis (includes all meals, bush activities and drinks – excluding premium drinks). Full day of activities in Meru National Park, which incorporates an 84 km2 rhino sanctuary, making Meru one of the prime destinations to see rhino in their natural habitat. The bird life is extraordinarily colorful and abundant with over 400 species of birds. Meru National Park is also famous for large elephant herds, lion and bird life, and more diversity of animal species than any park in East Africa. In addition the morning and afternoon game drives, activities include fishing in the streams, game drives to Kora and Bisanadi National Reserves, and night game drives back to camp. This morning, an early departure for a safari walk with your ranger. Lunch served at the Lodge before your transfer back to the Meru airstrip for a 90 minute flight to Kenya’s premiere wildlife viewing region. Landing in the middle of the Masai Mara Reserve, the Sand River Masai Mara team will welcome you at the Keekorok airstrip. You will be transferred to the camp with a game drive en-route, and arriving in time for Sundowners, followed by dinner. Your two night stay at Sand River Masai Mara is in a Luxurious Safari Tent, and is on all-inclusive basis (includes all meals, bush activities and drinks – excluding premium drinks). Sand River Masai Mara is an ideal destination, at any time of the year. For those wishing to enjoy exceptional game-viewing. The National Reserve is best known for its large concentration of big cats, such as leopard, cheetah and, of course, lion. Even the dramatic arrival of the Annual Migration merely adds to an already abundant resident wildlife that awaits discovery. 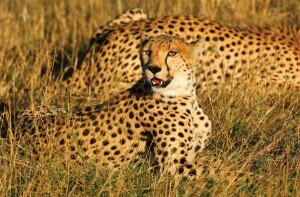 Enjoy a bush breakfast, followed by a full day of game viewing in the Masai Mara Game Reserve. Often called only “The Mara”, the Reserve covers 580 sq miles and rises 500 to 7,100 feet above sea level. The terrain of the reserve is primarily grassland and riverine forest with clumps of distinctive acacia trees. The wildlife of the Masai Mara is world-renowned, with the so-called “Big Five”- buffalo, elephant, leopard, lion and rhinoceros – evident throughout the year. 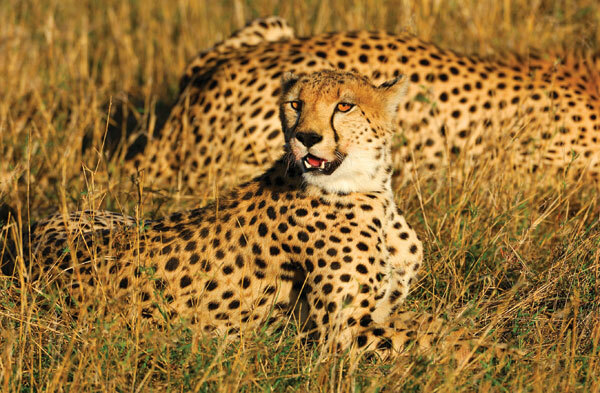 The “Big Nine” – including cheetah, zebra, giraffe and hippo – extends this experience. Let us not forget the colorful inhabitants of this exceptional landscape. 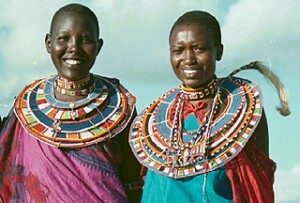 The Masai are a proud semi-nomadic cattle-rearing people with a fascinating culture, divided into a number of sub-tribes some of which share the Mara region. The Masai are an ever-present reminder of the history and cultural heritage of this sublime and enigmatic landscape, and will surely leave a lasting impression for all. Return to camp for a dinner under the stars. Optional Balloon Safari: We suggest you book a hot air balloon safari over the Masai Mara for today, an excellent addition to your Kenya Flying Safari experience. You depart the camp before sunrise and transfer in the balloon safari company’s vehicle (with other travelers) to the balloon staging site. After a briefing from the pilot, the crew will inflate the envelope. At sunrise you begin your ballooning adventure with flights at different levels to give you both an overview of Masai Mara National Reserve and a close look at the wildlife. After about 50 minutes, you land and the chase crew will take you to a picnic site where you are provided a bush breakfast complete with bubbly to celebrate your successful flight in the tradition of balloonists over the centuries. You then transfer back to the camp. From $500, per person. This morning will be your last game drive in the Masai Mara Reserve. After lunch, you will be transferred back to the Keekorok airstrip for your mid-afternoon flight to Wilson Airport Nairobi, where you will be welcomed upon arrival. You will be chauffeured to Jomo Kenyatta International Airport; before arriving there, your driver will stop at one of Nairobi’s restaurants where dinner will be served. You will arrive at the airport in time for your outbound international flight. Arrive home with memories of your Kenya Flying Safari to last a lifetime and with the anticipation of your next trip to Kenya. …When I go to Kenya… It’s sure tough coming home! The trip was so wonderful and everyone enjoyed it very much. Everything worked out great; each leg of our journey went well and were all very special in their own way. Seeing the different terrains and animals in each area was such a good experience for everyone. That was my first time to Lewa [Safari Camp] and I loved it! Every year I participate in a fundraiser for Lewa so it was especially nice to be able to see where the donations go to and I am so thankful for their conservation program. I think it’s such a beautiful camp and their staff is especially wonderful. We went game driving… near Governors Camp. Great service! [My] group also really enjoyed the beautiful Norfolk Hotel as well. Thanks again!